Our team has been busy! We currently have home sellers in the double digits prepped to sell their homes here in San Antonio over the next few months, and we have many home buyers relocating to our city, too. The average sales price went back up! After a slight decline for a couple of months, the price point nudged up–not much, but a bit! It went from $257,855 to $259,571, which is less than 1%, but given bad weather, holidays, higher interest rates–we saw mid-5′s throughout November/ December–and the start of the government shutdown, we’ll take it! It’ll be interesting to see the effect of the shutdown on the housing market in January’s numbers. Keller Williams had an even higher price point at $293,918, showing a 12% higher sales price across the city over the combined average of all other brokerages. We are still seeing under 3.5 months of inventory on our market, which means that if everyone who is currently looking to buy a home moved forward to purchase, we would run out of houses to buy in less than 3.5 months. A balanced market is closer to 5 months, and a buyer’s market is closer to 6 months, but the rapid increase in technology in the real estate industry is also compressing the timeline for buyer’s to find and purchase a home, so those numbers may no longer be quite so accurate. A buyer’s market may mean only 5 months now. 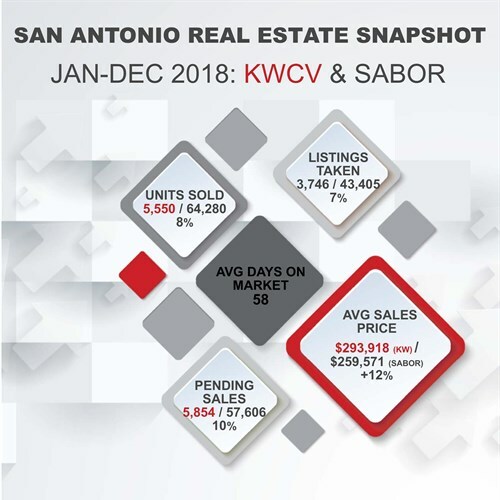 We can see, though, that just under 3,800 homeowners in San Antonio chose to LIST their home for sale in December, reflecting 7% of the total number of homes listed for sale in 2018. If you look at the number of homes SOLD in December, though, you’ll see over 5,500 homes sold. So, if under 4,000 listed, and over 5,500 sold, that’s a difference of roughly 1,500 less houses on market by the end of the month, pushing us increasingly more into a tighter inventory market. We were looking at a shifted market just a few months back, but December’s sales show none of those indications. December reflects high sales volume, price increases, and over 5,800 homes in escrow–almost 10% of the sales for the ENTIRE year occurred in December. The drop in interest rates in January should help sustain a busy housing market, but the implications of the government shutdown remain to be seen. Early forecasts suggest that 1 in 10 home buyers will be affected by the government shutdown. If you have questions about what the housing market update means for your particular situation, please don’t hesitate to reach out. Check back each month to get an understanding of what is going on in the housing market in San Antonio.